Every bloomin’ April First, the joke’s on me, as I’m reminded of the foolishness that remains my absolute low point as a compost-minded backyard gardener. The chief reason I bought my small home on a corner lot in Westport a decade ago this spring was the tulip magnolia tree in the front yard. After noticing the real estate listing in the local paper, I arranged to meet a real estate agent at the house the first Sunday in April. I made up my mind to buy the place as soon as I pulled into the rutted driveway and saw the magnificent tulip magnolia in full bloom. Talk about curb appeal! The house and rest of the property was a mess. But this specimen of a tree stood out, even though it besieged by tangly vines and surrounded by spiky barberry bushes and sucker saplings from its own spreading roots. About 30 feet tall and with a canopy almost as wide, it was covered by fist-sized cups of white flowers tinged with magenta. Peering through the scrub bushes and stringy saplings that rose from its roots, I could see that the tree’s bones were very good. The tree’s lowest branches started about waist-high and spread in handy increments nearly horizontally; a perfect tree for my five-year-old son to climb. Underneath its canopy was a smattering of crocuses, poking up through the weeds that spread across what I could tell was once an oval island of tended garden surrounded by grass. Placed as it was in the front corner of my yard, and that part of the property being on a slight bend in the road, it was the prettiest tree in the whole neighborhood. Approaching my house from either direction, rounding a slight bend, it was though you were driving straight toward the tree and its blossoming beauty. It was a head-turner, that magnificent magnolia, if only for that week or two each spring. After moving in I pruned the tree of its sucker branches and cleared the ground around it of the wild wisteria and Chinese bitterroot vines that sought to overtake it. My son and the neighborhood kids he soon befriended loved to climb the tree’s smooth-bark trunk and perch on its low-spreading main branches. For that spring and the next, the tulip magnolia made for great fun and wonderful photo ops, especially in the brief blooming moment, often just at Easter. 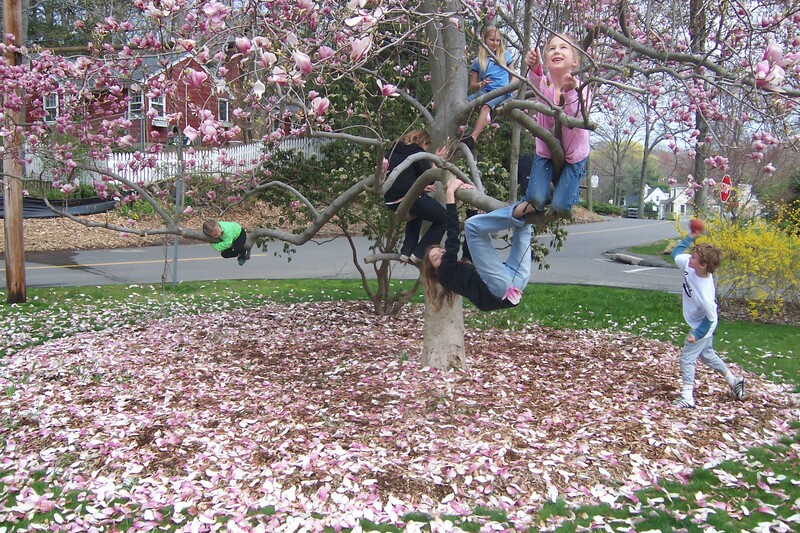 A playdate in the tulip magnolia, in its final years. For a backyard composter, a tulip magnolia is no great shakes. I raked up the fallen petals each spring; the silky pieces melted into my pile like breath strips on your tongue. The seed pods that all those flowers produced were less welcome, as were the waxy coated leaves that rained down each fall. Some compost books consider them more of a nuisance, as they take too long to decompose, but into the mix they went as well. To restore the garden island the tree grew on and also to give the kids a softer landing in case they were ever to fall from its limbs, I added a layer of wood-chip mulch around its base, spreading it out to the tree’s drip line. I proudly counted how many wheelbarrow loads the ground beneath the tree could absorb, mentally tallying both Safe Daddy points and the kudos for sustainable gardening methods. The tree thrived, as did the kids. An autumn or two on, a neighbor took down a towering spruce tree that posed a threat to his house. I drove by just as the tree crew was chipping up the last of the branches and blowing them into a plywood-sided box in the back of the two-ton dump truck. I told them they could deposit the load of chips in my driveway up the street. It was like getting a hundred Christmas trees, all ground into a poultice of mulched needles, bark and sappy chips. The mound was already steaming when I spread load after load of minced spruce across the garden island on which my tulip magnolia ruled. My greatest fear was that I would bury the crocuses and daffodils too deeply and they wouldn’t be able to find their way up to the sun come the spring. The following April the magnolia bloomed magnificently. The spring bulbs did well, too. The third spring surprised me – less blooms crowned the tulip magnolia. I chalked it up to the vagaries of a tough winter. By the fourth spring, the tree bloomed only sparsely, and produced small, wilted leaves. Neighbors walking by would stop to chat, commenting and offering advice. I watered deeply. That summer, I hammered a score of tree fertilizer spikes into the ground all around the tree. Then one afternoon the fellow who had done all the tree work for me when first I moved in happened by. I’d been impressed by how he handled the massive hulk of the dead old willow tree in the backyard, saved my roof from the overhanging mulberry trees, showed no mercy for the swamp maples and other “junk” trees. Men who climb tall trees with ropes and snarling chain saws for a living command a certain level of respect from earthbound gardeners like me. He stopped his truck in the street, rolled down his window and in the kindest way possible gave me the news that he clearly thought I should have known all along: Magnolias didn’t like their surface roots to be covered by mulch. The heat from the decomposition cooks them and could kill the tree. I thought back to the previous fall, sticking my hand in the deep layer of mulch under the tree to feel its warmth. After so many years of neglect, however benign, I thought I was giving the tulip magnolia a warm blanket of freshly made compostible wood chips from which to draw nutrients. As soon as he drove off, I grabbed my wheelbarrow and shovel and removed dozens of barrows fulls of old mulch from around the tree, spreading it elsewhere in the yard as best I could. I drove more fertilizer spikes into the ground, as penitence. But by then it was too late. In its final spring, the tulip magnolia mustered just a few, misshapen blooms and a smattering of leaves, most of which shimmered to the ground during a hot spell in July. I took the tree down that August, climbing up the bare branches myself with a borrowed chain saw. Its demise, played out over the better part of four years, was slow-motion, every-day proof of my foolishness and ignorance as a gardener. Simply put, I’d loved the tree to death, killing it with what I thought was the kindness of layer upon layer of a steaming hot wood chips. All gardeners live with failure and most hope to learn from their mistakes, self-inflicted or otherwise. These days, I spread wood chips much more sparingly across my perennial beds, and steer clear of mulch from fir or pine trees. I replaced the tulip tree with a weeping willow. A curiously old-fashioned choice, I admit, in a modern garden. But I didn’t have the heart to plant a new flowering tree in place of the tulip magnolia. And I knew from the towering willow that had died of old age in the backyard long before I bought the place that it would thrive despite me. Native to China, it’s considered an invasive, but I’ve read that it was first brought to American by a Connecticut trader in the 18th century. It’s a local import that has thrived. I found the willow in the remnant section of the local nursery. Its roots had grown through the drainage holes of its black plastic container and spread deep into the gravel patch the bucket rested on. I needed help from a nursery laborer to wrest it from its spot and took it home at a bargain price of $20 or so, its wispy branches fluttering out of the back hatch of my SUV. Five years on, the rescued willow is now already nearly as tall as the tulip magnolia it succeeded. I’ve loped off the upper branches to widen its canopy and to keep if from getting too close to the utility wires strung along the street. Its setting in the corner of my yard leaves it far from any drain pipes. Anyway, I’m pretty sure its thirsty roots have tapped into a long-buried spring that flows from the granite ledge across the street and under the road nearest the tree. The willow, from two summers ago, just then starting to “weep.” It’s now twice as big and full. Two years before that, I’d brought it home in the back of my SUV. The willow may lack the tulip magnolia’s magnificent presence each spring, but its loping, dangling yellow branches are striking in their own way, early to bud in the spring and late to let go of its slender, oblong leaves in the fall. And like the massive old willow that once graced the backyard where my pile now sits, it is a hardy living thing that I know will survive whatever foolishness I will inflict upon it.